Our neighborhood has an annual chili supper and each year our family makes at least one chili to contribute. In the past it was always a version of the Moosewood Cookbook’s vegetarian chili. It’s often been a winner of the supper’s light-hearted contest, both in hot and mild versions. Over the years, however, I realized that many of the ingredients of that chili and I were not friends. If you do not have any food intolerances, it’s a great recipe, and pretty creative: bulgur wheat takes the place of meat to make a true chili texture. Other fairly typical chili ingredients include kidney beans, peppers, and tomatoes. Sautéed vegetables such as onion, garlic, celery, and carrots plus chili spices round out the flavor. Jeffrey has made variations with hot peppers and fresh ginger. Next time he makes it I will be sure to include it on the blog. A couple of years ago I came up with a paleo-style chili I named Autumnal Chili. It won second place at the supper, and I posted it to the blog. That chili still had tomatoes, though. Last year I think I experimented with a nightshade-free version, but apparently that version was not memorable. This year I decided to start fresh with a new recipe. I did not plan ahead so it was necessary to use what I had on hand. I had sausage and bacon, plus spinach and other veggies. 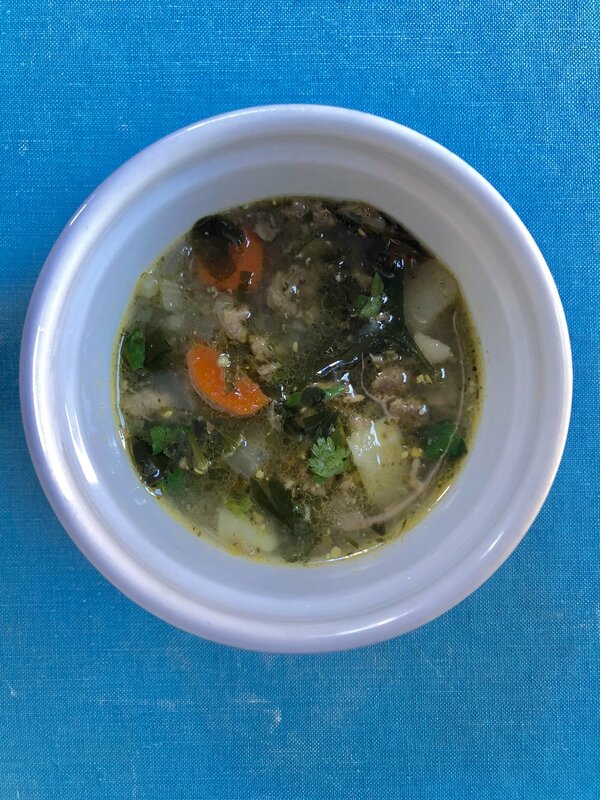 I found Paleo Newbie’s Italian Sausage Potato Soup and decided to adapt that to a chili-style stew. It was quite tasty and I won third place this year, so I guess others thought so, too! The main things I did to this recipe were to change up the spices a little, add more veggies, and decrease the liquid to make it chunkier and more worthy of the name chili. I prefer a mild chili so I used a mild sausage, and not Italian. The sausage was still hotter than I expected, but did not make the chili hot. If you love spicy things take note as you will probably need to add more heat in other ways, even with a hot sausage. Though I was not aiming for Italian flavors, I did add a little basil in the form of pesto I made in the summer and froze. I much prefer the flavor to dried basil. I skipped the cayenne and added plenty of cumin, plus coriander and cardamom. I left off traditional chili powder so I could say that it was at least mostly nightshade-free (I wasn’t sure about the sausage). We try to list at least the most common allergens at a public dinner. White sweet potatoes are the Irish potato substitute in this recipe, but they are pretty sweet. I added some turnips to balance the flavor better. Other white root vegetables you can include are daikon, parsnips, white or yellow carrots, celery root, and Jerusalem artichokes. Cauliflower stems are another good option. To the vegetable mix of garlic, onion, and carrot I added celery. Cubes of squash, especially a less-sweet squash such as acorn (assuming you’re already using sweet potato) would add substance. I think the only vegetable I would be cautious with would be the cruciferous vegetables. They are some of my favorite veggies but would likely change the flavor pretty dramatically if you used more than a small amount. The original recipe calls for spinach, and that is what I had, but any other tender or baby green would work well. Adapt this recipe to what is in season and what you have on hand and make it your own! Spices to taste: cumin, coriander, cardamom, chili, cayenne, etc. In a Dutch oven begin to cook the sausage and bacon. Add, in order: spices, onion, carrot, celery, and garlic. Start with 1 teaspoon of spices, total (much less cayenne), and add more later as needed. Salt the veggies as you add them, stir well, and cook a bit before adding the next vegetable. Drain off any excess fat as needed. Reserve it, in case you need or want it later. Once those vegetables are soft and sausage and bacon are browned, add white vegetables and broth. The original recipe called for 3 white sweet potatoes. Use an equivalent amount or more of any or all of the following: turnips, daikon, parsnips, white or yellow carrots, celery root, and Jerusalem artichokes, cauliflower stems, and a little white sweet potato. Simmer until veggies begin to get tender. Add broth as needed for proper consistency. Add greens and pesto, stir until combined. Taste and adjust seasonings. Simmer until the greens are done to your liking (probably just a few minutes), top with a green garnish such as parsley, and serve.